Way back in the 90s my mum had a perfume called Cassini which my sister & I were both obsessed with. I remember the scent well & to me this toner smells exactly like Cassini. Anyone else remember it? I looked up the notes in Cassini & it turns out that some of the ingredients are the same so I thought that was really cool! Anyway this toner is formulated using Ayurvedic principles so it's full of natural ingredients including turmeric, marigold, patchouli, coriander, papaya, goji berry & aloe vera. It promises to balance your skin tone & brighten the complexion whilst locking in moisture. It feels really refreshing & immediately perks up dull looking skin. However a couple of days after I started using this I noticed that I was getting a bit of irritation & had developed an itchy pink rash. This was the only new skincare product that I had introduced so I stopped using it & the rash went away. It just goes to show that natural products aren't always best & all the lovely botanical ingredients that made it smell like my favourite retro perfume weren't great for my skin. I think that body lotions are quite boring to talk about but the formula of this one is simply divine! This body lotion feels absolutely incredible on the skin. After applying it my skin not only feels softer but there is a visible difference in it's condition too. The consistency of this product is quite thin & watery. This allows it to sink in very quickly whilst delivering long lasting hydration. The lotion simply melts into the skin giving it a silky texture with a healthy looking sheen. It is enriched with a complex of naturally derived oils, aloe vera & orange extract. Citrus scents are normally my fave but I'm not a huge fan of this as it has a strong masculine orange fragrance. The formula is fantastic though so I would love to try this out in one of the other scents that Roger & Gallet have available. This bath & shower gel is 99% natural with a sulphate-free foaming base making it suitable for all skin types. It features vitamin E & cucumber extracts to gently cleanse the skin without stripping it of oils. The gel is fragrance free so it's great for all the family including small children. Although I do have sensitive, eczema-prone skin I still prefer scented shower gels so I've used it to bathe my daughter instead. Bloom And Blossom actually had expectant mothers in mind when creating this product as strong scents can bring on morning sickness. When I was pregnant I was very diligent about only eating food & using products that would be safe for my baby so I can understand why you would switch to a natural shower gel like this. I'm sure that many anxious first time mothers would really appreciate receiving this shower gel in a gift basket. I've tried quite a few different NUXE products but somehow I don't think I've ever used their Crème Prodigieuse before. I'm not sure how I missed it because this moisturiser is one of their hero products. Crème Prodigieuse is aimed towards those with stressed, normal to combination skin. The texture is a lot thicker than I was expecting but it sinks into the skin quickly. It feels rich & comforting without being heavy or greasy. My skin is left feeling softer, fresher & calmer when I use it. It has a semi-matte finish so it works well on my skin type & balances out an oily T-Zone. This product is intended for use as a day cream but it can also be used at night with an oil or hydrating serum. It's a lovely everyday moisturiser & a good choice if your skin is feeling particularly sensitive. 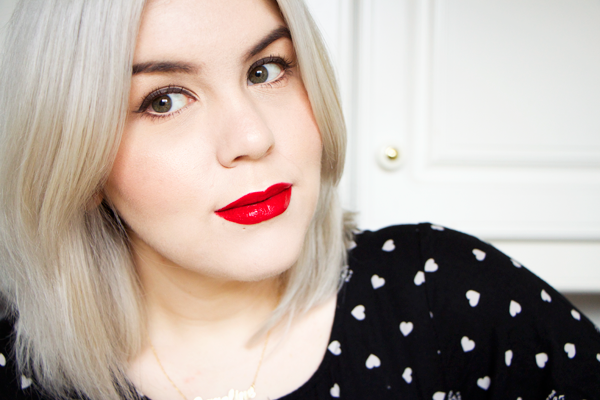 Liquid lipsticks are the current big thing in beauty. My personal favourites are the Jeffree Star ones but I'm always open to trying new lip products. 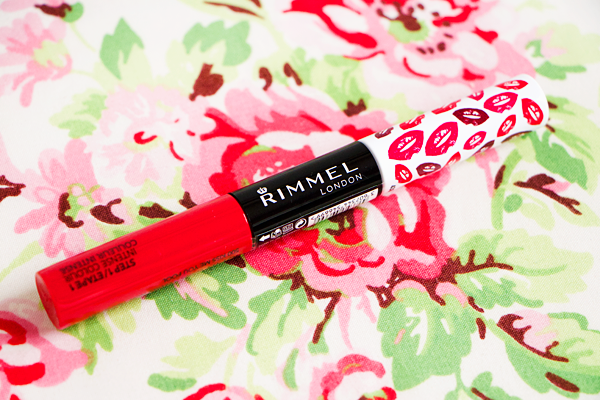 I've tried & loved the Rimmel Apocalips Lip Velvets so I had high hopes for Provocalips. These liquid lipsticks have a high shine finish. They promise 16 hours of wear & are transfer-proof. Each lipstick has two different ends, one with the colour & one with a clear balm to lock the colour in place. Here I have Kiss Me You Fool which is a classic bright red shade. It's incredibly bold & certain to turn a few heads. The lipstick itself is easy to apply & the colour is highly pigmented. It feels a bit tacky until you apply the balm on top, then it's really comfortable to wear & will stay in place all day long. It starts to feel a bit dry & gross after a few hours but if you keep reapplying the balm then it feels fine. It doesn't come off when I kiss, drink or eat. In fact it just doesn't come off! 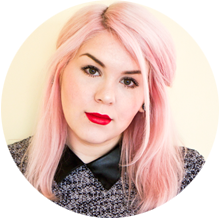 Wipes & micellar water won't cut it, you need a really good cleansing oil to remove this lipstick. Personally I prefer liquid lipsticks with a matte finish but there's no denying the ultimate staying power of Provacalips. In general I don't think that face wipes are an efficient way of removing your makeup. I don't like to prejudge products so I decided to give these ones a go anyway. Wipes can be a godsend when you're too drunk or too tired to take your makeup off properly so it's always good to keep some handy. 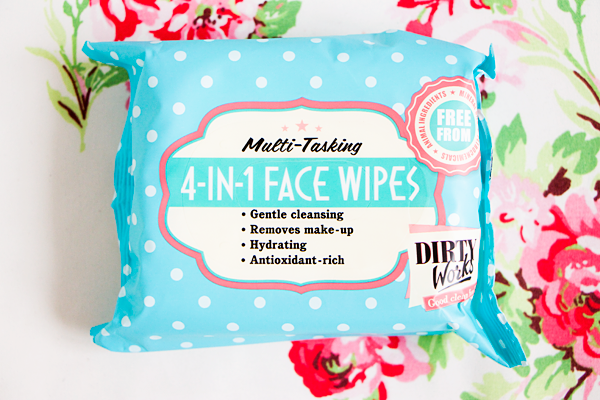 Dirty Works face wipes feature lots of soothing ingredients & claim to gently cleanse the skin without irritating it. Unfortunately they didn't work very well for me & it took a lot of harsh scrubbing to remove all of my makeup with them. They barely touched my mascara & eyeliner. I washed my face properly with a cleansing oil afterwards & a lot of makeup came off in the muslin cloth so the wipes did bugger all really! There are good face wipes out there, sadly these ones are pretty pathetic. 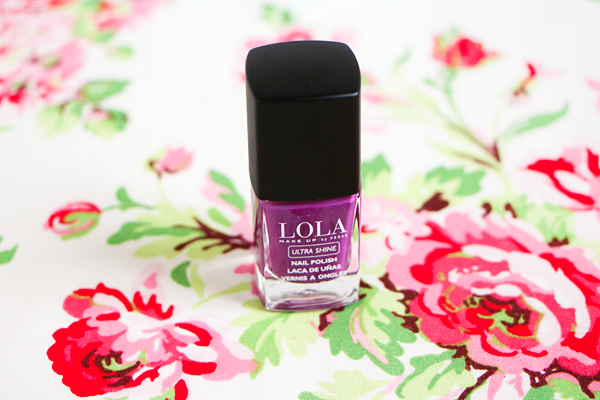 Purple is one of my favourite colours to wear on my nails at this time of year. 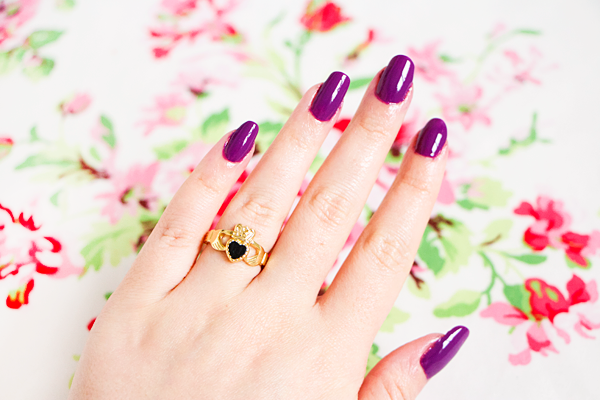 I actually wore this at Halloween & it definitely made for a vampy manicure. I really like the colour & this polish has a wonderfully glossy finish. It was formulated with gel technology which is supposed to make it fluid, shiny & long lasting. The wear was disappointing though & it started to chip off the tips of my nails within 24 hours. I even used a base coat & top coat so for it to start coming off my nails that soon was a bit annoying. It didn't dry particularly quickly either so I can't say I think much of this polish formula. How cute are these hair ties?! I've been wanting some in this style for ages & this sparkly set is very me. They are made from soft, durable elastic & are designed to be kind to your hair. Much like the Invisibobble, they are snag-free & don't leave any imprints in my hair. 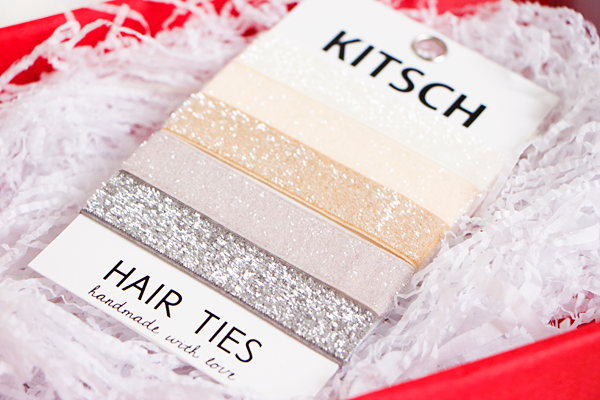 These hair ties look a lot prettier though & I like wearing them as glittery bracelets too. The soft pastel colours of the Prima Ballerina set will go with everything & the glitter really stays put. I love hyaluronic acid serums & Hydraluron is the product that really got me into using them. 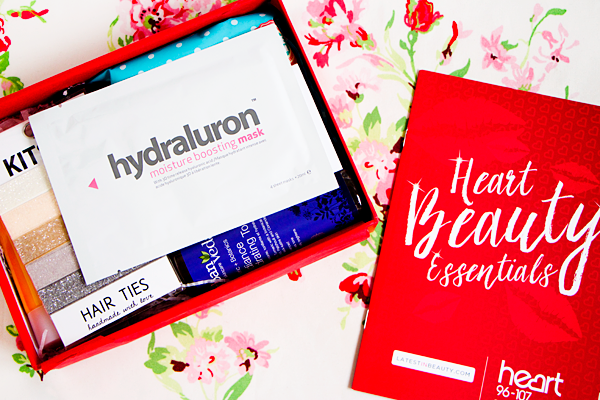 To take their serum to the next level Indeed Labs decided to create sheet masks infused with Hydraluron which was a stroke of pure genius. Sheet masks are very popular in Asia & they have started to make their way over here. They look ridiculous but the benefits are great. Most of them are used to intensely rehydrate the skin so it makes a lot of sense for there to be a Hydraluron one. You simply unfold the fabric sheet & drape it onto your skin. After 15 minutes you take off the sheet & massage in any remaining product. It left my skin feeling really plump & soft with any fine lines smoothed out. 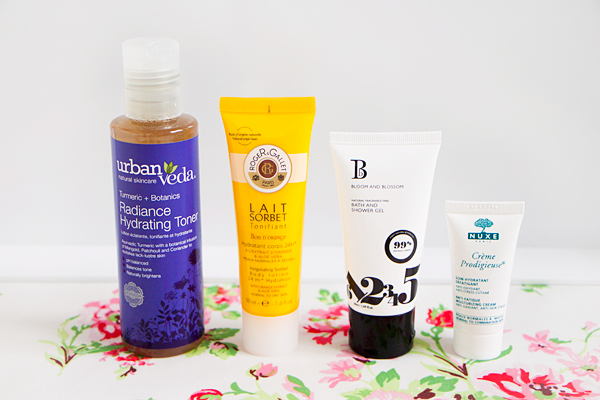 They're a powerful boost for dehydrated skin & would be perfect for use before a special occasion. 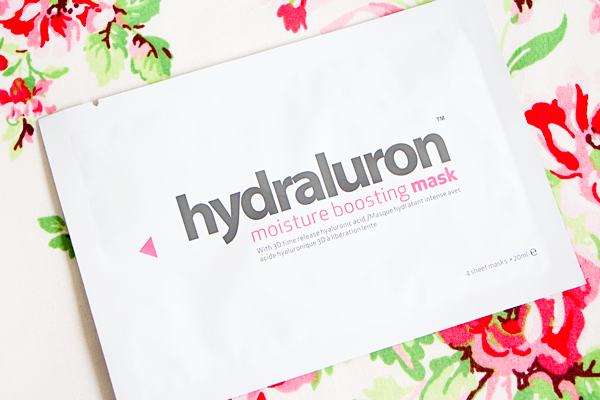 The Hydraluron Moisture Boosting Masks are made in Japan so technically they are authentic Asian beauty products. The only downside to the Hydraluron sheet masks is that they are very expensive in comparison to their Asian counterparts. However you can easily find them in your local Boots which does make them seem infinitely more appealing. If you're a regular reader of my blog you'll know that I love acid exfoliators & I think that this is one of the best exfoliating products on the market today. 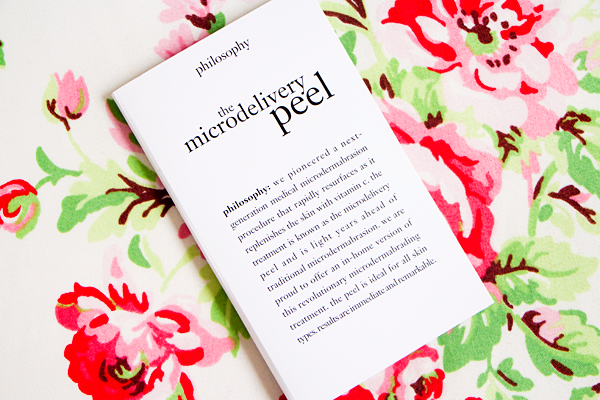 The Microdelivery Peel combines vitamin C crystals with lactic and salicylic acid for unbelievably softer, smoother & brighter looking skin. The effects are immediate & mimic the results of professional microdermabrasion. It completely transforms the texture of your skin & after just one use you'll be stroking your face in disbelief all day long. One of these sample sachets actually prompted me to buy the full size version of this product a long time ago so feel free to check out my really old review of The Microdelivery Peel. I've learned quite a lot about skincare since writing that review but with my new knowledge I can still wholeheartedly say that this product is amazing. This little sachet reminded me just how fab it is & I encourage all of you to try it out! Overall I was really pleased with the contents of this box. Although some things didn't work so well for me I still appreciated the opportunity to try them out. My favourite items were the Hydraluron Moisture Boosting Mask, the Kitsch hair ties & the Rimmel Provocalips. There's a great selection of products here & it is also excellent value for money. 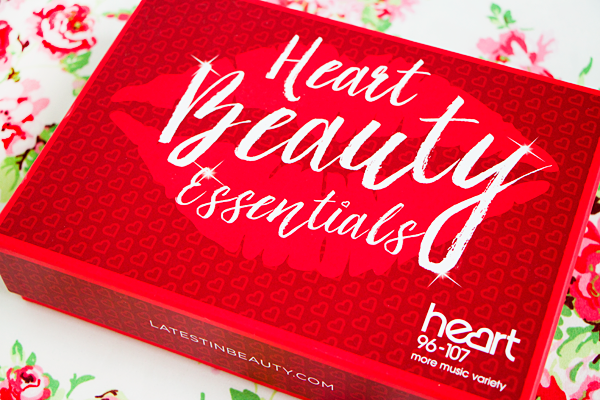 The box costs just £17.99 but the contents are worth over £70! If you want to save a little bit more money you can use the code HEARTBB15 for free P&P. Visit the Latest In Beauty website to find out more.